Show your bookish pride with a customizable handmade book magnet! 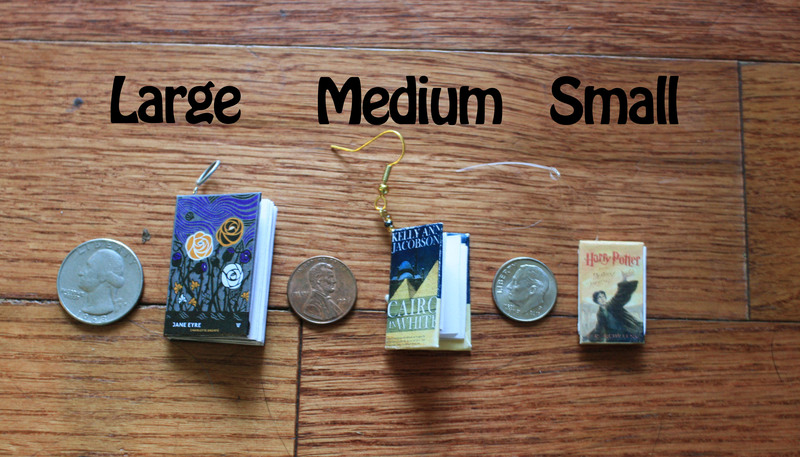 This miniature book replica also makes a wonderful gift for the book nerd in your life. Just tell me which book (or books) you want, and I can make it! High-quality “hardcover” editions ($15) are bound traditionally using thread and archival glue. More affordable “paperback” covers ($8) are printed directly onto high-quality stock paper. Both versions include up to sixteen pages of customizable quotes. I also make more affordable magnets with only the book cover ($3.50 for one; $10 for a set of three). I can make a matching set, or you may mix-and-match. You may also customize the cover art, quotes, paper color, and any other accessories (ribbon, beads, etc). In addition, I can customize book size and page numbers if you want something specific. Each book and book cover is unique, even in a set! The large pendant is 1 inch wide and 1.5 inches tall. It holds 16 pages of quotes, which is about 200 words. The medium is 0.85 inches wide and 1.25 inches tall. It holds 12 pages of quotes – about 150 words. The small is 0.65 inches wide and 1 inch tall. It holds 8 pages of quotes – about 100 words. All sizes open easily to display your favorite quotes.